Events / 2013−2014 / Photos 2013−2014 / Talk by Simon Smith: "Ukraine: The New Cold War?" 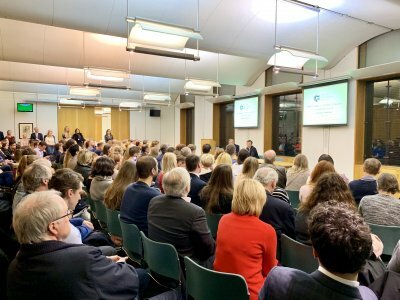 The Oxford University Ukrainian Society hosted His Excellency Simon Smith, Ambassador of the UK to Ukraine, in association with the Oxford International Relations Society. The Ambassador delivered a talk, entitled ‘Ukraine: The New Cold War?’ The talk was followed by a formal question and answer session, and then a drinks reception with Ambassador Smith himself. The event was open to paid members of the Ukrainian Society (and paid members of the Oxford International Relations Society).